NEW YORK (Nov. 22, 2015)  As the nation gathers to celebrate and give thanks with family and friends, the biggest spectacle of the holiday season returns as the 89th Annual Macy's Thanksgiving Day Parade travels the streets of New York City on Thursday, November 26 at 9:00 AM. More than 8,000 participants donning costumes, handling giant balloons or striking up the band will travel through Manhattan at the sound of the time-honored phrase, "Let's Have a Parade." With an audience of 3.5 million along the parade route and 50 million viewing the nationwide telecast, the Macy's Thanksgiving Day Parade is the nation's most beloved holiday pageant. From its humble beginnings in 1924 to the breathtaking spectacle of today, the Macy's Parade lineup unfolds each year in grand fashion. The parade's lineup for 2015 features 17 giant character balloons; 12 marching bands; 27 floats; 1,000 clowns; 1,100 cheerleaders and dancers; 24 novelty balloons; plus a host of celebrity performers. The 89th Annual Macy's Thanksgiving Day Parade will step off at 77th Street and Central Park West. The procession will travel down to Columbus Circle, turn onto Central Park South and march down 6th Avenue/Avenue of the Americas to 34th Street. 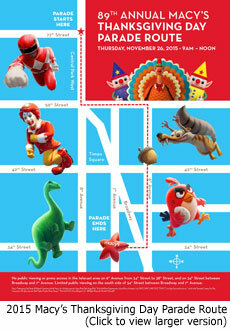 At 34th Street, the Parade will make its final turn west and end at 7th Avenue in front of Macy's Herald Square. Fans can kick off their parade experience early by downloading the free Macy's Thanksgiving Day Parade App from the iTunes App Store or from Google Play. Americans coast-to-coast can share in the magic of the parade through NBC-TV's national telecast hosted by the TODAY Show's Matt Lauer, Al Roker and Savannah Guthrie. The telecast will air from 9:00 AM to 12 Noon in all time zones. Ahead of the parade, the national broadcast will showcase the Radio City Rockettes and the best theatrical productions currently playing on Broadway, including Fiddler on the Roof, Finding Neverland, The King & I, On Your Feet!, and Something Rotten. Viewers will also get a sneak preview performance from NBC's The Wiz Live. The 89th Annual Macy's Parade will be a crowd-pleasing spectacle that features 17 giant character balloons; 12 marching bands; 27 floats; 1,000 clowns; 1,100 cheerleaders and dancers; 24 novelty/ornament balloons, balloonicles, balloonheads and trycaloons; and a host of celebrity performers. Kicking off the march and cutting the ribbon at the head of the parade will be executive producer Amy Kule who will be joined by Roseann Levy, a longtime Macy's employee celebrating the 60th year of volunteering her time to put together this magical event for the city of New York and the nation. Macy's will introduce four new giant character balloons this year, including Angry Birds' Red by Rovio Entertainment; the pre-historic and legendary DINO by Sinclair Oil; Ice Age's Scrat and his Acorn by Twentieth Century Fox; and Ronald McDonald debuting in his fourth whimsical giant balloon design. The float lineup brings six new additions including Big City Cheer! by Spirit of America Productions; The Colonel's Road Trip to NYC by Kentucky Fried Chicken; The Cranberry Cooperative by Ocean Spray; Discover Adventure! by Build-A-Bear; Heartwarming Holiday Countdown by Hallmark Channel; and Snoopy's Doghouse by Peanuts Worldwide which is celebrating the 50th anniversary of "A Charlie Brown Christmas." Following is the list of 2015 Macy's Thanksgiving Day Parade entries (all talent, performances, line-up and information is subject to change). • The parade also boasts 24 novelty/ornament balloons and balloonicles. 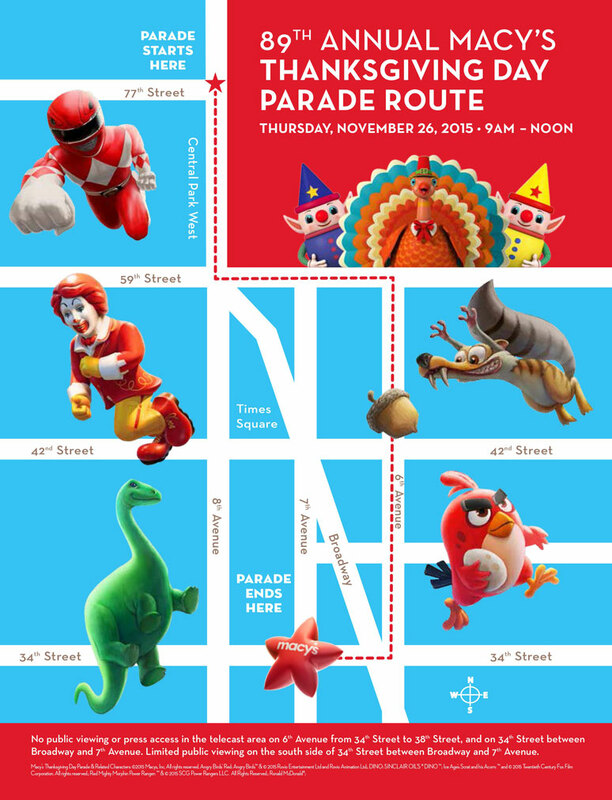 • The parade will also feature special units including Big Apple Circus Wagons, FDNY 1924 Model T Vintage Fire Truck, McDonald's Big Red Shoe Car, Mounted Parks Enforcement Patrol and NYPD Mounted Unit; the Nutracker and Mouse King; and the Planters Nutmobile. • The parade also features 1,000 clowns. A holiday treat for children everywhere, the Macy's Thanksgiving Day Parade's finale features the biggest star of all, the one-and-only Santa Claus. As his sleigh comes into view, Macy's will wish everyone "Happy Holidays" and a "Merry Christmas." Further information on the Macy's Thanksgiving Day Parade can be obtained by calling the Parade Hotline at 212-494-4495 or by visiting www.macys.com/parade. Follow @macys and join the conversation at #MacysParade on various social networks. See more information on Marching.com about the Macy's Thanksgiving Day Parade and learn what music the Macy's Thanksgiving Day Parade Marching Bands will be playing. 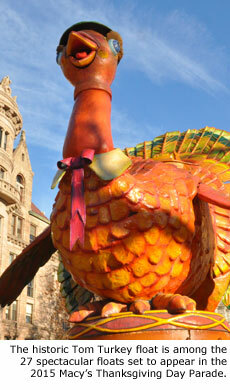 Text and images courtesy of Macy's Thanksgiving Day Parade. 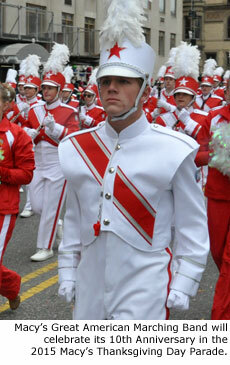 Photos by Marching.com.